Betty P. McGinnis, 85, loving wife, mother, grandmother, and friend, died peacefully at Brethren Village, Lititz, on Wednesday, April 10, 2019. She was born and raised in Leola, PA by her parents, the late Eugene and Kathryn Parmer and was the wife of C. Carl McGinnis having recently celebrated 63 years of marriage. She was a 1951 graduate of Upper Leacock High School and she and her husband lived in Leola (Forest Hills) for 57 years prior to relocating to Brethren Village. 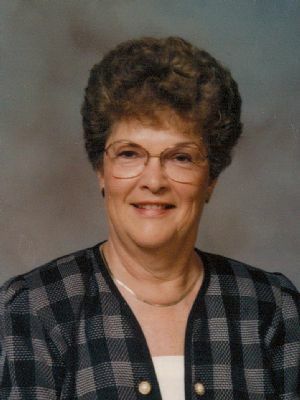 Betty worked as a secretary at Sperry New Holland, was a devoted homemaker and later worked as a medical secretary for the late Dr. Joseph Knepper, Leola. As a 69-year member of the Leola Methodist Church, she was active as a Sunday School teacher, a member of church council, helped prepare countless meals for funeral lunches and assisted with church offerings. Family was everything to Betty. She was happiest spending time with her husband, children and grandchildren. Thanks in part to Betty, annual family vacations at the beach will provide lifelong memories for the entire family as well as memories experienced during an all-family Caribbean Cruise to celebrate Betty and Carl's 50th wedding anniversary. Her hobbies included knitting, reading, playing pinochle, and participating in church activities. She will be sorely missed by all those whose lives she touched. In addition to her husband, Carl, she is survived by three daughters: Cindy Simmons wife of Ronald Simmons, Leola, Linda Bergstrom wife of Eric Bergstrom, Lancaster, and Nancy Lopez wife of Mark Lopez, Leola; six grandchildren, Ashlee Simmons, Brittany Simmons, Michael Bergstrom, Matthew Bergstrom, Ryan Lopez, Joel Lopez and a great-grandson, Jack Bergstrom; a brother, Donald husband of Betty Jo Parmer, E. Petersburg. The family extends their sincere thanks and appreciation to all the devoted and loving care-givers at the Brethren Village Rehab Center. Funeral Services will take place at the Leola United Methodist Church, 7 W. Main St., Leola PA 17540 on Tuesday, Apr. 16, 2019 at 11 a.m. Viewing: Monday evening, 6-8 p.m. at Furman Home for Funerals and one hour prior to the service on Tuesday at the church. Interment: Trumbauer Memorial Cemetery, Leola. Memorial contributions are welcomed to the Love Fund of the Leola U.M. Church c/o the above address.